This Centerpiece is a grand display of holiday elegance. 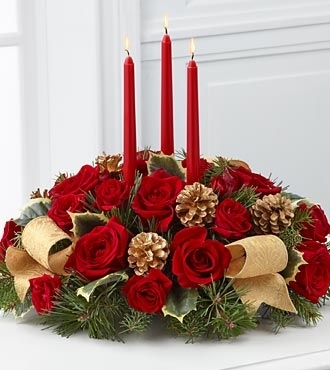 Red roses and spray roses pop against a backdrop of assorted holiday greens and variegated holly that beautifully encircle three red taper candles. Accented with gold pinecones and gold metallic brocade ribbon, this centerpiece creates a warm and enchanting glow to benefit their holiday festivities. GOOD bouquet includes 8 stems. 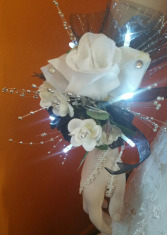 Approximately 7"H x 14"W. BETTER bouquet includes 12 stems. 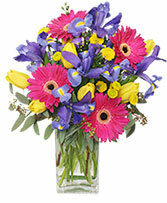 Approximately 9"H x 18"W. BEST bouquet includes 16 stems. Approximately 9"H x 20"W.